Formula ?If you know your body fat %, Lean Mass formula may be more accurate. Each of the foods we eat are made up of three “macros” (macronutrients). These macros are carbohydrate (carbs), protein, and fat. Chicken is high in the protein macro but has no carbs. Rice is high in carbs, but very little fat or protein. This calculator tells you the best ratio of macros that you should eat to achieve your goals. From there, you need to determine the macros of all the foods you eat. By counting them each day, you can reach a target that leads to fat loss. Macro counting is extremely successful, and can free you from the “good food, bad food” mindset. You don’t need to make radical shifts in your diet, nor deprive yourself of your favorite foods. Just make sure you are within your macro counts for each day, and you’re good to go! If you need help, we publish some extensive guides here. 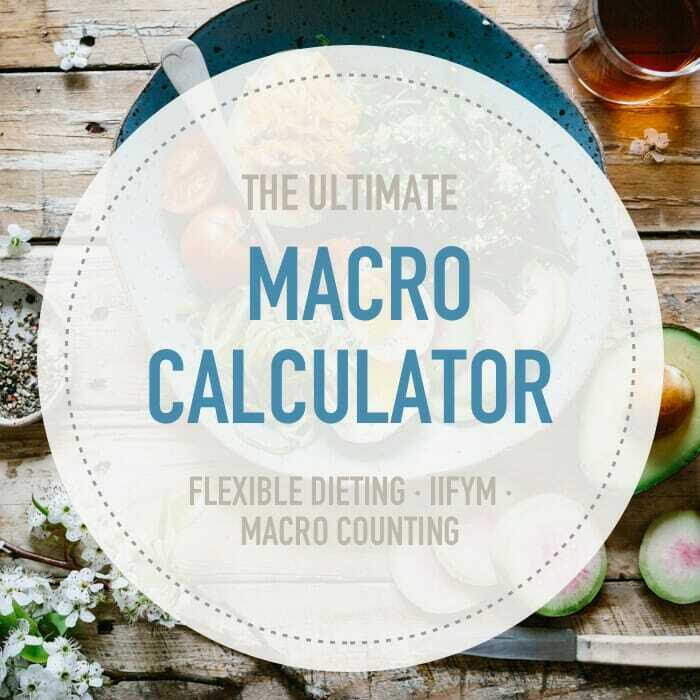 This macro calculator gives you the ability to adjust your macros at 4 different goal settings. Lose puts you in a 20% calorie deficit which promotes safe, steady weight loss. Lose 10% puts you in a 10% calorie deficit and is intended for those with less than 10 pounds to lose and who also wish to build muscle at the same time. Maintain allows you to eat at macro levels that will keep you at your current weight. Gain puts you in a 20% calorie surplus and is designed for people who are wanting to build muscle fast in conjunction with a comprehensive weight training program. It can also be used by people who are underweight. 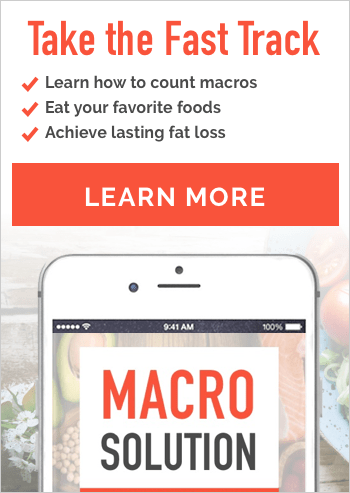 How Do You Calculate the Macros? Protein ratio is set at .825 grams per pound of bodyweight but this can be adjusted depending on your individual stats and goals. Fats are set at 30% of daily energy expenditure. Carbohydrate grams come from the remainder. Daily energy expenditure is calculated from your age, gender, height, weight, and exercise output. See the full guide to macro ratios here. Which Formula – Normal or Lean Mass? The default (normal) formula is fine for most people. However, there are some exceptions. 1. If you are very lean (low body fat percentage) the default formula may not be accurate. Use the “Lean Body Mass” setting. This uses a formula that factors specific body fat percentage into the equation and since muscle tissue burns many more calories than fat tissue while even at rest, it will give you a higher TDEE. This is perfect for “athletic body types” that want to use macro counting to gain more muscle mass. 2. If you are classified as obese and have a lot of weight to lose, the standard formula will not be accurate because the equation used, factors for an average body fat percentage. If you happen to be above average it will skew the results. Please see this article for more clarification on how to do macro counting if you are obese. You can calculate your ideal body weight here. Setting protein to Moderate adjusts the ratio to .65 grams per pound of body weight. This is appropriate for sedentary individuals or for people with higher body fat percentages. High is appropriate for people who are active, do moderate strength training, and have an average body fat percentage. Maximum will set to 1 gram / lb. This is appropriate for those who are wanting to gain weight/muscle mass and do intense training. We go into greater detail about how to choose an appropriate protein level when counting macros so give that article a read if you’re still unsure. By default, the results show the amount of grams of macronutrient should be eaten each day. Click on meal numbers to split this into a “per meal” basis for counting macros. See our Healthy 5 Day Flexible Meal Plan. It includes 3 meals and 2 snacks per day. By default, the results are for maintaining weight. Select either lose or gain if you are trying to lose fat or gain muscle. These are good starting points, but you may have to play around with your macros until you find your personal goal-reaching sweet spot. You can then count macros until you reach your desired goal. A higher activity level means a higher daily calorie goal (TDEE). For example; if you can maintain your weight at 2,000 calories per day, then adding vigorous daily exercise to this means you need more calories to maintain your weight. Figure out your activity level using the Calories Burned Calculator. The same rule applies even if your goal is to lose weight. If you are sedentary and your goal is to lose weight, your calorie goal might be (for example) 1,600 calories per day. If you decide to start exercising, the calculator will increase your daily calorie goal (say, to 1,800 calories/day). Although it may seem counter-intuitive, more energy is required to fuel your workouts, and your metabolism is increased – therefore calories should be higher. Sedentary: Just normal everyday activity like a little walking, a couple flights of stairs, eating etc. Light: Any activity that burns an additional 200-400 calories for females or 250-500 calories for a males more than your sedentary amount. Moderate: Any activity that burns an additional 400-650 calories for females or 500-800 calories for males more than your sedentary amount. Extreme: Any activity that burns more than about 650 calories for females or more than 800 calories for males in addition to your sedentary amount. This varies based on your individual stats, but you can get a more specific amount of calorie burn by simply subtracting your sedentary calorie amount from the chosen exercise level amount. Too much physical activity combined with low calories could lead to muscle catabolism (breakdown of muscle fiber). This is not a good thing, and can actually stall your weight loss, so eat up! If you need some inspiration, check out these incredible transformation stories of from people who used counting macros to reach their goals. Hi Shilpa, You have the best weight loss results if you eat according to how your body needs/uses energy. Therefore, on your rest days, you should eat at sedentary levels. I am trying to lose weight, but carbs are the highest goal, why is that? I though losing weight/fat meant eating less carbs. Hi Ariana, Losing weight means maintaining a calorie deficit. Some people do this by reducing their carb intake. I suggest you read this article about flexible dieting so that you can understand the concept the calculator is aligning with. How do i calculate the macros with everyday food? Hi Rose please refer to this article or download our Macro Solution which takes you through the process step-by-step. How much exercise you do is based on your calculation. If you selected Moderately active then you would have to exercise enough to offset the difference between your TDEE for sedentary and your TDEE for moderately active. For example. If your sedentary weight loss TDEE is 1700 and your moderately active weight loss TDEE is 2200 you would do enough cardio to burn 500 calories. If in training for a marathon, I ran 20 miles, and burned 1700 cals on the run, would it work to add 1700 cals to sedentary calculation? Thanks! You will see better results if keep your workouts to about an hour a day, If you do a lot of leg exercises you will gain muscles in your legs and therefore they will get bigger. I find a lot of people try to spot train (workout the parts that have more fat) and end up making those parts bigger with muscles instead of making them smaller. The best way to lose size is to lose fat and train the parts that are lacking size to give you body shape. That being said don’t stop working out your legs altogehter… just don’t make it a main focus. Hope you’re doing well. Now that the holidays are here I’m figuring out how I can stay track with my macros and still enjoy food with my family and friends. I wanted to ask you if I eat regular potatoes vs sweet potatoes or white bread vs wheat bread or a fried chicken etc but stay within my macros is that going to affect my weight? I’m visiting my parents for Xmas and New Years so you know what the drill is a lot of food, drinking, dinner outings etc so I just want to make sure I don’t mess up what I’ve achieved so far. I’ll be there for good amount of time. Any tips/ suggestions would be really appreciated. Hi Naina, As long as you stay within your calorie/macro guidelines switching to those less healthy foods won’t derail your progress. Try to find ways to exercise while you’re away and perhaps try to introduce your family to healthier cooking while you’re there. Perhaps cook a couple meals for the family. Happy Holidays! What is the definition of “light” activity vs. moderate? I workout at Orangetheory 4x a week for an hour each class. So 30 mins of HIIT cardio, 30 mins of weights. Hi Kris, We have it defined in the article below the calculator. That should help make it more clear. I’ve been tracking my macros and the protein says to hit 111g and 154g carbs. I’m usually always over on protein and hit around 130 and my carbs are under 154 but my total calories are still at what they should be or a little under. Is this ok if I’m trying to loose weight? I do also want to gain muscle and I workout with dumbbells. Hi Alicia, There’s always some wiggle room when it comes to macro ratios and the calculator is giving you a good place to start but it’s not set in stone. If what you’re doing is working then keep doing it. If it’s not helping you reach your goals then you may have to adjust things. 59 years old 4”11” weight is 151 and at a sitting job? Hi Gail, plug your stats into the calculator and choose sedentary, low protein. The macro totals default by showing your daily totals but you can switch this to meals by clicking the number of meals you want it to divide your macros by. On the macros is it at the end of the day you make sure your in range? Or is it every meal??! Hi Eleanor, Please see our article on counting macros as a vegetarian here. Hi! At the normal protein setting, it says my carb goal is 42g per meal… my brain tells me that it’s a little too high… also, do veggies count as carbs? Hi Tara, Your brain is misleading you. Carbs in themselves do not cause weight gain or prevent weight loss when eaten in relation to your weight loss TDEE. Yes, veggies count towards your carb total and a little to your protein goal as well. A few veggies also have a bit of fat. Also, it’s better to divide your macros over 3 meals and 2 snacks so that you’re eating about 2-3 hours. Typically, an extra 400 calories are entered added to the daily TDEE, and protein levels are set higher. Hi DJ, You goal is to hit your targets as closely as possible. We encourage people to try to be within 5 grams of your macro targets. So as per your suggestion I was looking to readjust my macros in MFP after losing 10lbs. However, i soon realized that since i don’t have the premium version it doesn’t let me adjust my macros at 1% increment and therefore i need to round it of to the nearest 5% increment. By doing so my macros are still the same (40C,30P,30F) as before when I was 10lbs heavier. Is there a better way to adjust or represent it? If not, how do i ensure i continue losing weight? Hi Nania, with 10 pounds lost you won’t see that much difference in your macros. About 2-3 grams lower in carbs and protein and 1 gram lower in fat. Therefore, don’t stress over it and continue as is. Great job on the 10 pounds, that’s awesome! What if my activity varies day to day? 3 days I run 10km-20km (road and trail) 3 days I do strength work, and 1 or 2 days, I rest. so is it moderate? light? For people who have varying degrees of activity, often it’s a good strategy to use your sedentary TDEE as your base and then add in the calories burned by various exercises. This way you are eating better in tune with what your body needs on a given day. We show you how to set this up in MyFitnessPal here.